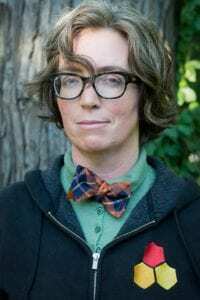 Gabrielle Calvocoressi is the author of The Last Time I Saw Amelia Earhart, Apocalyptic Swing (a finalist for the LA Times Book Prize), and Rocket Fantastic, winner of the Audre Lorde Award for Lesbian Poetry. The recipient of numerous awards and fellowships including a Stegner Fellowship and Jones Lectureship from Stanford University; a Rona Jaffe Woman Writer’s Award; a Lannan Foundation residency in Marfa, TX; the Bernard F. Conners Prize from The Paris Review; and a residency from the Civitella di Ranieri Foundation, among others. Calvocoressi’s poems have been published or are forthcoming in numerous magazines and journals including The Baffler, The New York Times, POETRY, Boston Review, Kenyon Review, Tin House, and The New Yorker. Calvocoressi is an Editor at Large at Los Angeles Review of Books, and Poetry Editor at Southern Cultures. Works in progress include a non-fiction book entitled, The Year I Didn’t Kill Myself and a novel, The Alderman of the Graveyard. Calvocoressi teaches at UNC Chapel Hill and lives in Carrboro, NC, where joy, compassion, and social justice are at the center of their personal and poetic practice.